In Gardner's Beacon, Vol. III, No. 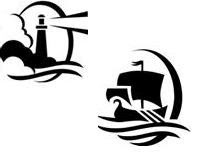 4, there is a little bit of bio information on Samuel Shattuck who was a step-son of Thomas and son of Thomas' last wife (which wife? we say 2nd, some say 3rd). 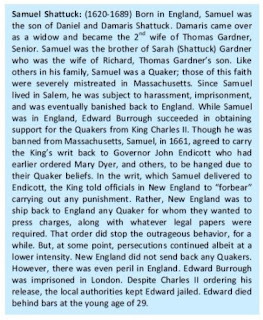 As the issue reported, Samuel brought back instructions to John Endicott from Charles II for him to quit picking in the Quakers. In doing so, Samuel put himself at risk. Of course, the writ took a long while to take effect. It was too late for Mary Dyer and others. These tales have been told in several places and deserve continued (and periodic) attention. Recently, Gardner Research had an inquiry about the stated father of Samuel (and husband of Damaris). The issue said Daniel. Was this a supported statement? The first activity was to find the source for this. In preparation for the issue, several publications had been reviewed, including the early one by Lemuel Shattuck and Lydia Hinchman. Too, there were many on-line sites previewed. We checked the Barney database at Nantucket. The first name was not given. On a quick review of material on the web, there are several suggestion (Samuel, William, Daniel, Daniel Samuel, Samuel William) that do not quote authority. The error turns out to be not following Dr. Frank who said (100 years ago) that Samuel's father was unknown. That is still the case. 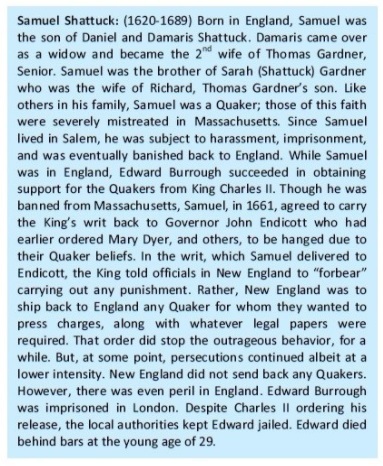 The gist of the article was about Samuel's efforts for the Quakers, plus his experience. Too, that issue continued a time-line for Thomas' children. Why Daniel was picked is anyone's guess. So, we are putting an entry in our Afterthoughts & Modifications page. Too, we will work on having such additions easily seen. But, the lesson learned is, if in doubt, don't shout. However, just that brings in a whole lot of discussion, especially with continual changes as we see with technology. Too, though, it gets our attention back to Samuel and his parents.Moriarty mentioned in one of his TAG articles that the relationship between the Shattucks, Popes and Gardners needs a deeper look. We wonder if anyone has attempted that, yet. Now, having looked at this, there is an open issue from earlier: Wives of George.